L3DT Users' Community • View topic - exporting texture error. heyya im trying to export the texture file as any filetype that photoshop supports. deselect "split map into tiles"
To save that image, the FreeImage library has to allocate a contiguous block of 1.4GB as a buffer. That error occurs when the operating system couldn't allocate the buffer. How much RAM do you have? ill try again after shutting down some proccesses. but is there a way to let L3DT use the virtual RAM in the preferences or something? As I understand it, all Windows programs are always using virtual RAM (see Microsoft). However, virtual memory is only useful for paging separate blocks of RAM that are not in use. If you request one gigantic block of RAM that is larger than the amount of physical RAM you have, it will be refused (I think that's how it works anyway; can anyone confirm/deny this?). 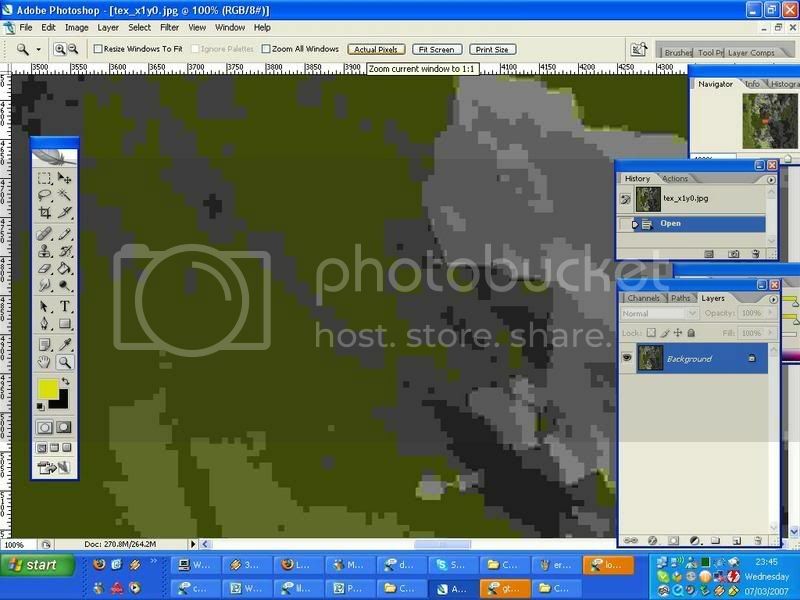 Anyway, to get around this, programs themselves must implement their own paging system; Photoshop does it, L3DT does it (mosaic maps), and other programs that deal with large map/image/data blocks do it. Now, FreeImage does actually have a paging system, but currently it only works with TIFF, ICO and GIF formats, and not the more useful BMP, JPG and PNG formats. This is why when writing the FreeImage plugin for L3DT I did not use their multi-page features. However, I can write a new plugin that uses L3DT's paging system to save large maps as single bitmap images, and I've put that on the to-do list. Before I get carried away with that, though, can you verify that on your system you can open Photoshop and create a new RGB image that is 19,456 x 19,456 pixels, save it as a bitmap, and load it again? I'd like to be sure that it will work before I start coding another format plugin. i did try shutting down all but vital proccesses, but i still got the same error. i have loaded 20k x 20k images before in photoshop and it takes its sweet time, but works eventually. ill try again later tonight when im on my own computer. 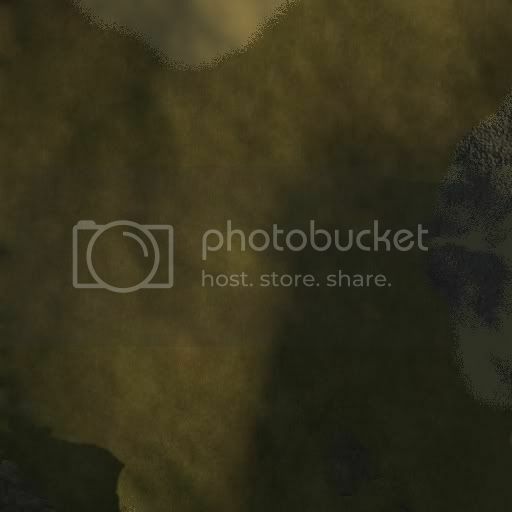 if i saved it as tiles, is there a way to convert those files into bmp/jpeg etc. it'd take some time but with that i could join the tiles together in photoshop. again im not on my own computer so i cant try it out at the moment. dead.rabit wrote: if i saved it as tiles, is there a way to convert those files into bmp/jpeg etc. 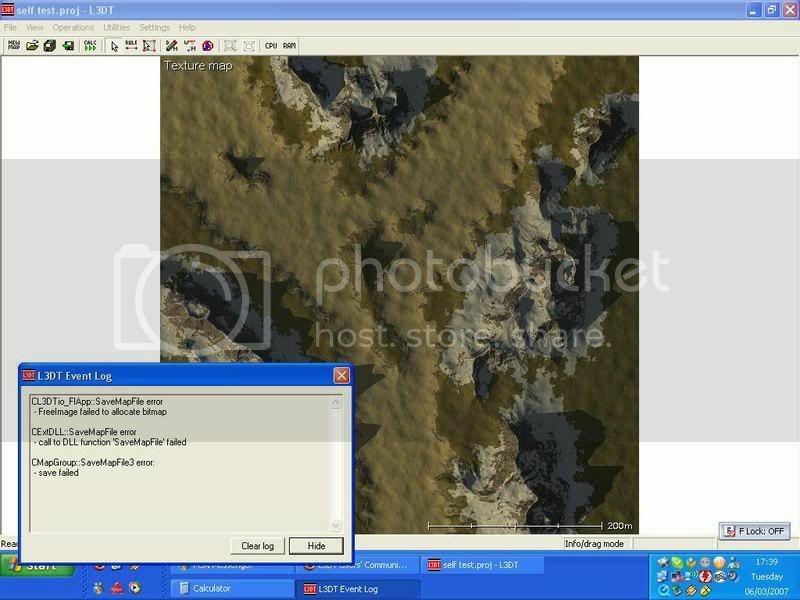 The tiles are already saved as bmp/jpeg/png/tga, depending on what you set in file->preferences. ok well, the long awaited update. as for exporting as tiles. it worked fine however looking at the pictures afterwards they looked very posterized. photoshop is fine with editing saving and opening RGB bitmaps at this kind of size, although its a little troublesome waiting for it to calculate things, ive never known it to crash. 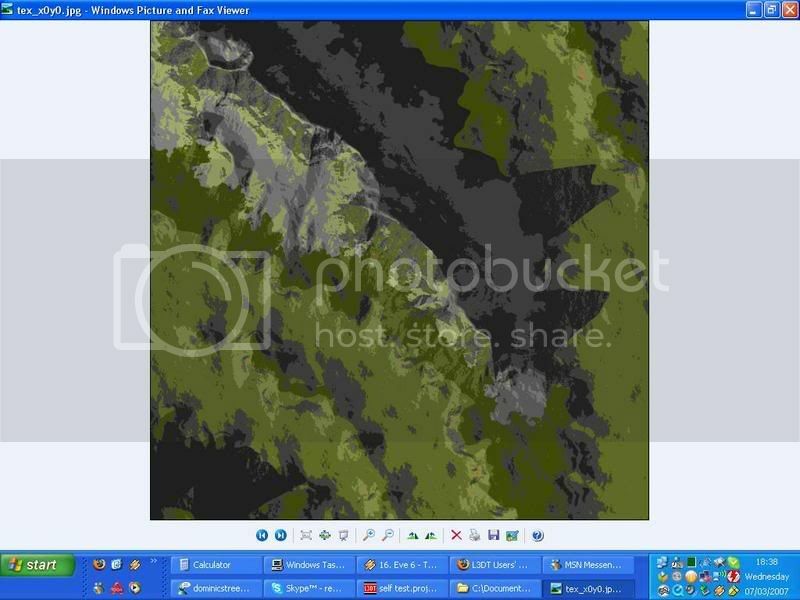 ok ive confirmed the detail of the exported mosaic images depends on how big the tiles are. large ones look very posterized. this however is the picture i got from rendering 9728x9728 (half of 19456x19456) giving me 4 images to stitch together. is there something in the pref's or anything to repair this? and im afraid its the same in photoshop. i took this screenshot at "actual pixels"
just checked my preferences and discovered that saving textures-> jpg's the quality is set to "1"
i have had this problem quite often because of this damned wireless keyboard. if the reciever is more then 4 inches away only 1/5th of the keys work. I'll put a warning in the plugin when the JPEG quality is less than 50.